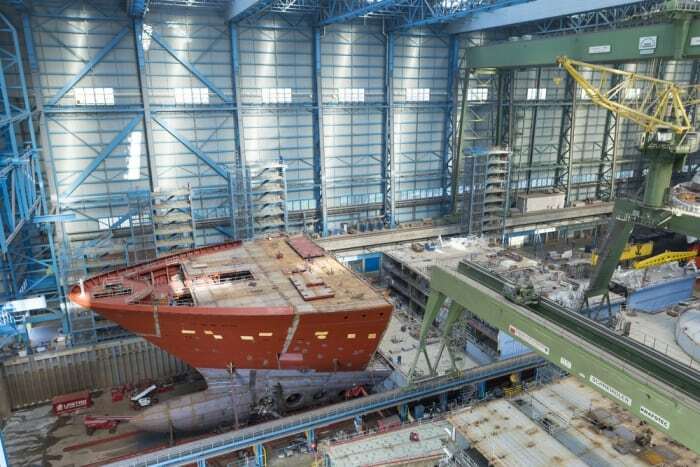 Royal Caribbean recently released more construction photos of their upcoming Spectrum of the Seas cruise ship. This first Ultra Quantum-class cruise ship is currently being built at Meyer Werft Shipyard in Papenburg, Germany. In November, the keel was laid for Spectrum of the Seas. The keel-laying signifies the beginning of the ship’s physical construction. During the ceremony, a 620-ton block was lifted into the building dock with an 800-ton crane and laid into place. The first Quantum Ultra ship will debut Royal’s first suites-only area, featuring the Golden and Silver suites in a private enclave at the forward end of the ship on decks 13 through 16. Those booked in these cabins will have special keycard access, a private elevator, and a dedicated restaurant and lounge. They will also have access to The Balcony, a private outdoor space for relaxing with the best views onboard, and The Boutique, a shopping area where guests can book private shopping experiences. For families, Spectrum of the Seas will also include a two-level, 2,809-square-foot Ultimate Family Suite, which debuted aboard Symphony of the Seas earlier this year. The suite has three bedrooms and can hold up to 11 guests. Kids have their own space on the upper level, including a slide that will take them to the living area below. Everyone in the family can enjoy the recreation room, with surround-sound equipment for a night of karaoke, movies, or video games. The first in the Quantum Ultra class of ships, Spectrum will feature the line’s first private area for suite guests, new stateroom categories, dining concepts, and experience – many of which have never been seen before at sea. The vessel will hold 4,246-guests, and will be the largest in Asia when she sails from Shanghai starting in June 2019.